A woman who carried an artificial heart in a rucksack after her own was removed has died from transplant complications. 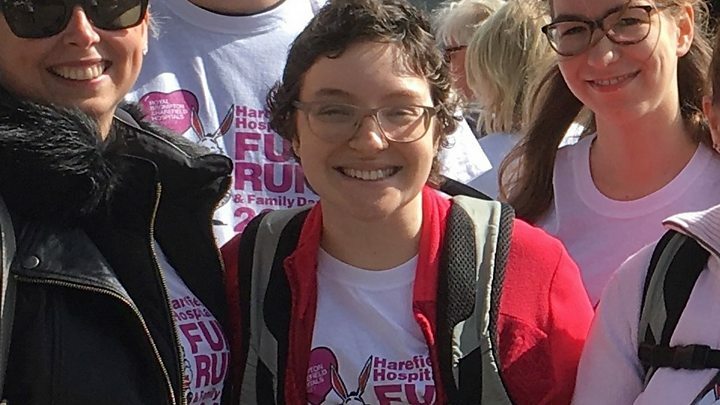 Rebecca Henderson, 24, from Bicester, was given the green light to receive a donor organ after scans showed she had been free of cancer for a year. But her relatives said she died on Wednesday in Harefield Hospital “surrounded by family and friends”. She was one of only two people in the UK with an artificial heart. Her family said: “Becca was a beautiful, brilliant shining light in our lives. The Oxford University post-graduate student had her heart removed due to cancer in 2017. Surgeon Stephen Westaby said “minuscule numbers of people” ever had cancer in the heart and Ms Henderson was “the most courageous young woman”. In October, she returned to study at Oxford and brought the 7kg artificial heart with her. “At no point did it ever occur to me to give up,” she told the BBC at the time. “No matter how hard it is for me, even if it is hard for me, it will then be easier for the next person. St Anne’s College, where she was studying, paid tribute to Ms Henderson’s “unwavering determination” and “contagious enthusiasm for college life”. “She had so many hopes and plans for the future and it is hard for us to realise that she will not have the chance to fulfil them,” it said in a statement. Her tutors added: “Becca was a person of extraordinary courage, humour and intellectual achievement as well as potential. Dr Janina Ramerez, an Oxford academic who was friends with Ms Henderson, said on Instagram she was “the strongest, bravest person I’ve ever met”. ← Secondary school places – not got what you wanted?